Ask to be placed on the Waiting List for these & I'll contact you as soon as yours is/are ready. Use the below form to reserve yours. One of my most popular items. This listing was originally created for a regular customer who ordered multiple copies. It takes time before conditions are right to make them. They're usually created during warm weather months here in the Northeast - less risk of breakage due to contact of hot pots with the cold air. Created from clay and smoke fired. 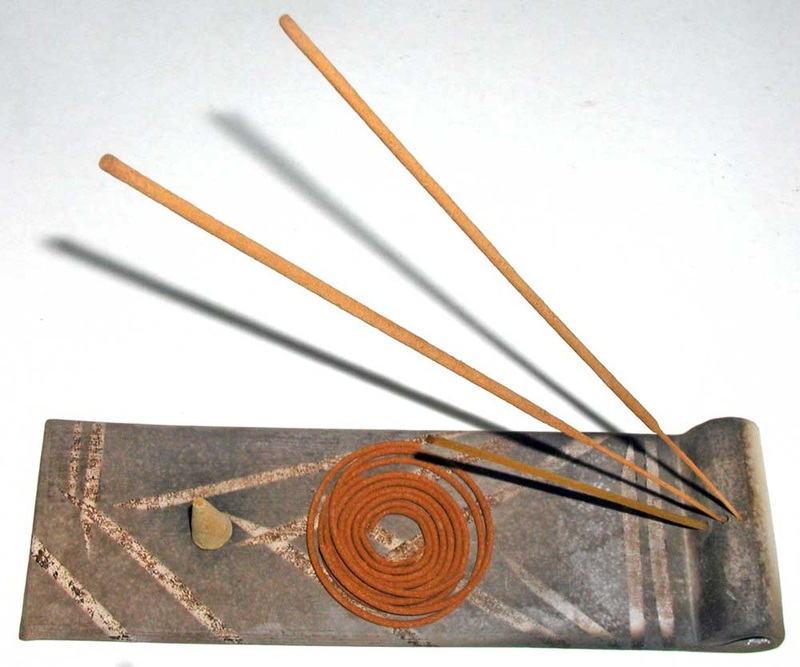 Picture demonstrates the various kinds of incense it can accommodate - cone; coil; stick. Put used matches inside the rolled end. Lighter areas of decoration are made with a material that resists being blackened by the smoke. Interpretation of wabi-sabi varies, but essentially, it means that variations and imperfections from piece to piece, when reflected upon, reveal their desirability, their understated elegance. Wabi-sabi is aesthetic appreciation of irregularities in color, texture, form, and decoration. In keeping with its principles, no individual tray emerges from the smoke fire identical to any other one. Impermanence is another wabi-sabi characteristic. If your precious object undergoes breakage, you might consider how to repair, continue to use, or re-purpose it as part of the process of experiencing it. Wabi-sabi observes 3 simple realities: "nothing lasts, nothing is finished, and nothing is perfect." Such clay art/pottery is often seen as the embodiment of the perception that a chip or breakage adds to the item's beauty, giving it greater meditative value. 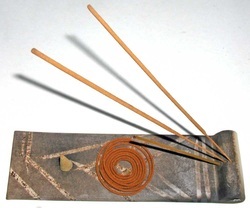 More on wabi-sabi at Wikpedia. This is current pricing, subject to change without notice. If you make your payment now, your item(s) will be shipped when it's(they're) finished. An average estimate is to allow 4-6 weeks from purchase date for your item to be delivered. The actual delivery date may be sooner or later, depending on when you order. Orders received during my breaks may undergo shipping delays. If you don't see the option you're looking for, please use the below form to contact me with questions.